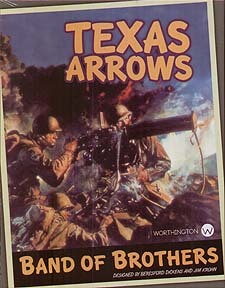 BAND OF BROTHERS: TEXAS ARROWS is the third in a series of fast playing games of squad level combat in WWII. It is an EXPANSION that requires both BAND OF BROTHERS: SCREAMING EAGLES and BAND OF BROTHERS: GHOST PANZER to play. Texas Arrows centres on the US 36th "Texas" Infantry Division and the module gets its name from the arrowhead that they used as a patch. Twelve scenarios follow the division from the Salerno landings in 1943, up the boot of Italy, through France, and into Germany. A VARIETY of Elite and First line US troops square off against a mixture of Panzer Grenadiers, First Line, and Second Line German troops. This makes for a whole host of interesting tactical decisions with the different combinations of pure infantry and mixed infantry/vehicle scenarios. Some of the NEW THINGS that show up include Mines, Fortified Positions, Night Attacks, Armed Halftracks, Level 3 Hills, Pillboxes, and Smoke Grenades. This module also contains TWO SHEETS OF UPDATED COUNTERS to replace those originally used in Screaming Eagles. For those who do not have mounted boards for the previous modules, this game has BOTH a MOUNTED and an UNMOUNTED version of the same, double-sided map that is used in this game.